In 1861, as the American Civil War approached, a 32-year-old lawyer named Sullivan Ballou left his wife of five years and two sons at home, and joined the war effort as a major in the Union Army. On July 14th of that year, acutely aware that particularly perilous times were ahead, he wrote, but didn't send, the following beautiful letter to his wife, in which he eloquently warned her of the dangers he faced and spoke of his love for both his family and country. 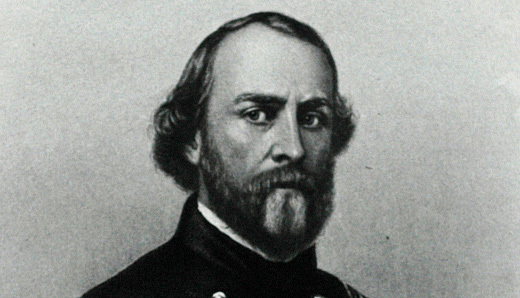 Sadly, two weeks after penning his letter later, Sullivan was killed in the First Battle of Bull Run—the first major conflict of a war that lasted four years and cost the lives of approximately 750’000 people—along with 93 of his men. 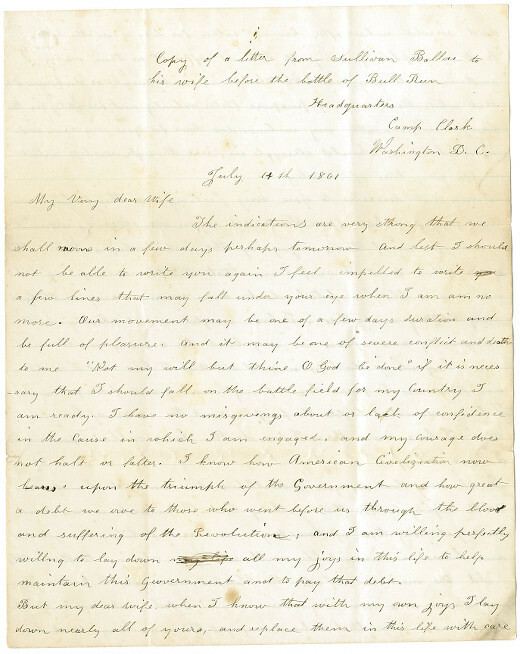 The letter was later found amongst his belongings and then then delivered to his widow, but has since been lost; this copy, thought to have been transcribed by a relative, is held at the Abraham Lincoln Presidential Library. Sarah, who was 24 when he died, never remarried. She passed away at 80 years of age, and is now buried alongside her husband in Providence, Rhode Island. The indications are very strong that we shall move in a few days perhaps tomorrow and lest I should not be able to write you again I feel impelled to write a few lines that may fall under your eye when I am am no more. Our movement may be one of a few days duration and be full of pleasure. And it may be one of severe conflict and death to me “Not my will but thine O God be done” if it is necessary that I should fall on the battlefield for my Country I am ready. I have no misgivings about or lack of confidence in the cause in which I am engaged, and my courage does not halt or falter. I know how American Civilization now leans upon the triumph of the Government and how great a debt we owe to those who went before us through the blood and suffering of the Revolution; and I am willing perfectly willing to lay down all my joys in this life to help maintain this Government and to pay that debt. But my dear wife, when I know that with my own joys I lay down nearly all of yours,– and replace them in this life with care and sorrow– when, after having eaten for long years the bitter fruit of orphanage myself, I must offer it as their only sustenance to my dear little children, is it weak or dishonorable that while the banner of purpose floats calmly and proudly in the breeze, underneath my unbounded love for you my dear wife and children should struggle in fierce though useless contest with my love of Country. I cannot describe to you my feelings on this calm summer night when two thousand men are sleeping around me, many of them enjoying the last perhaps before that of Death. And I suspicious that Death is creeping behind me with his fatal dart am communing with God my Country and thee. I have sought most closely and diligently and often in my breast for a wrong motive in thus hazarding the happiness of all that I love and I could not find one. A pure love of my Country and of the principles I have advocated before the people and the name of honour that I love more than I fear death, have called upon me and I have obeyed. Sarah my love for you is deathless it seems to bind me with mighty cables that nothing but Omnipotence can break. And yet my love of Country comes over me like a strong wind and bears me irresistibly with all those chains to the battlefield the memories of all the blissful moments I have enjoyed with you come crowding over me, and I feel most deeply grateful to God and you that I have enjoyed them so long. And how hard it is for me to give them up; and burn to ashes the hopes of future years when God willing we might still have loved and loved together and see our boys grow up to honourable manhood around us. I know I have but few and small claims upon Divine Providence but something whispers to me perhaps it is the wafted prayer of my little Edgar that I shall return to my loved ones unharmed. If I do not my dear Sarah never forget how much I loved you nor that when my last breath escapes me on the battlefield it will whisper your name. Forgive my many faults and the many pains I have caused you. How thoughtless how foolish I have sometimes been! How gladly would I wash out with my tears every little spot upon your happiness and struggle with all the misfortunes of this world to shield you and my children from harm but I cannot I must watch you from the spirit world and hover near you while you buffet the storms with your precious little freight – and wait with sad patience till we meet to part no more. But Oh Sarah! If the dead can come back to this earth and flit unseen around those they love I shall be always with you in the brightest day and the darkest night amidst your happiest scenes and gloomiest hours always always and when the soft breeze fans your cheek it shall be my breath or the cool air your throbbing temple it shall be my spirit passing by. Sarah, do not mourn me dead think I am gone and wait for me for we shall meet again. As for my little boys they will grow as I have done and never know a father’s love and care. Little Willie is too young to remember me long but my blue eyed Edgar will keep my frolics with him among the dimmest memories of his childhood. Sarah I have unlimited confidence in your maternal care and your development of their characters. Tell my two Mothers I call Gods blessings upon them. Oh! Sarah I wait for you then come to me and lead thither my children.